New Sioux 10mm Belt Sander. Adjustable head rotates 160 degree for greater flexibility. 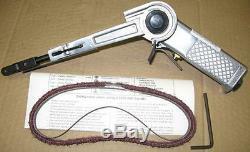 Lever throttle for feathering control. Spring lock feature for easy belt change. 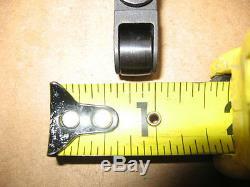 3/8" X 18" belt size. Air Pressure 90 PSI (6.2 Bar). CFM 6 (169.9 L/Min). Recommended Hose Size 3/8 (10mm). This tool comes with Belts!! (5) 80 Grit and (5) 100 Grit. The item "NEW Pneumatic Air 10mm Belt Sander 3/8 X 18 Sioux 5565" is in sale since Tuesday, March 14, 2017. 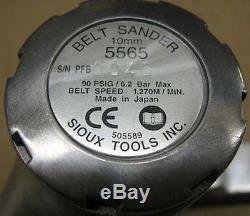 This item is in the category "Home & Garden\Tools & Workshop Equipment\Air Tools\Sanders". 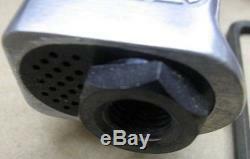 The seller is "eairtool_1" and is located in Detroit, Michigan. This item can be shipped to United States, Canada, United Kingdom, Denmark, Romania, Slovakia, Bulgaria, Czech republic, Finland, Hungary, Latvia, Lithuania, Malta, Estonia, Australia, Greece, Portugal, Cyprus, Slovenia, Japan, China, Sweden, South Korea, Indonesia, Taiwan, Thailand, Belgium, France, Hong Kong, Ireland, Netherlands, Poland, Spain, Italy, Germany, Austria, Israel, Mexico, New Zealand, Philippines, Singapore, Switzerland, Norway, Saudi arabia, Ukraine, United arab emirates, Qatar, Kuwait, Bahrain, Croatia, Malaysia, Brazil, Chile, Colombia, Costa rica, Dominican republic, Panama, Trinidad and tobago, Guatemala, El salvador, Honduras, Jamaica.